Drucker Antiques, recognized worldwide as the authority in Georg Jensen Hollowware, Flatware and Jewelry. Drucker Antiques offers the largest selection of vintage Georg Jensen available in the United States. Drucker Antiques focuses on 20th Century Design including Modern Scandinavian Design, European and American Arts and Crafts Movement Jewelry and 20th Century Studio jewelry. Drucker Antiques is a family business founded in 1977. Today, Bill Drucker owns and operates Drucker Antiques, expanding on the legacy started by its founders, Janet and Byrd Drucker. Bill Drucker is an author and frequent lecturer in Georg Jensen and contemporary jewelry. Bill Drucker, President of Drucker Antiques is a member of The Appraisers Association of America and The Palm Beach Appraisers Association Drucker Antiques is a member of The Antique & Art Dealers League of America. 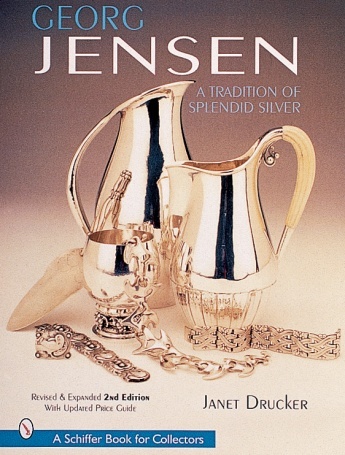 Now in its Second Edition, Georg Jensen: A Tradition of Splendid Silver, by Janet Drucker is considered by many the authoritative narrative on Georg Jensen hollowware, flatware and jewelry. Drucker Antiques is available by appointment and at select antique shows. ©2014 Drucker Antiques Inc. All Rights Reserved.